Opening March 10, the Booth Western Art Museum will present Ed Mell: New West Visionary, a traveling retrospective exhibit featuring 40 paintings and sculpture by the world-class artist. The exhibition will be on display in the museum’s Temporary Exhibition Gallery through August 21. 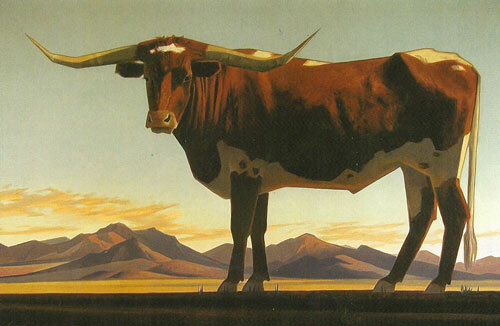 Ed Mell, Sonoran Longhorn, 2010, oil on linen, 36"x54"
The Tucson Museum of Art launched the traveling exhibition in February 2010. From there it headed north to the Museum of Northern Arizona. Its run at the Booth in Cartersville, Georgia, is held in conjunction with the museum’s Southeastern Cowboy Gathering of which Mell is also this year’s Featured Artist. Ed Mell, Sedona Shadows, 2004, oil on linen, 15"x30"
The public is invited to meet Mell during a reception the first evening of the Cowboy Gathering, from 5 to 7 pm, on Thursday, March 10. At 7 pm, the Arizona native will present a lecture on his artistic style and career highlights. Following the talk Mell will sign copies of the official souvenir Gathering poster featuring his iconic sculpture of a bucking horse called Jack Knife. Mell humbly reveals that he’s enjoying all this attention. Best known for his dramatic geometric views of Southwestern vistas, often combined with powerful weather elements, Mell credits Maynard Dixon as a major influence in his career. He approaches the landscape from two perspectives: expressive realism and abstraction. He suggests land forms and cloud formations with lines and planes alive with energy and sublime theatrics. Mell’s repertoire also includes floral and figurative subjects that incorporate elements of abstraction and cubism, all of which will be featured in the exhibition. From the Booth Museum, Ed Mell: New West Visionary travels to The Forbes Galleries in New York City where it will open in September 2011.